The plug-in lampholder system makes lamp changing quick and easy. 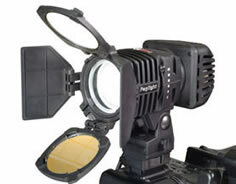 The Paglight M is supplied with a standard halogen lampholder, but Sofstart and PowerArc lampholders are also available. Softstart prevents the cold lamp start-up surge from activating the over-current protection circuits within Li-Ion batteries. The standard and Softstart lampholders utilise 10W, 20W and 35W standard G4-size 12V halogen lamps. Wattage variants can be changed without the need to handle the lamp. When not in use, each lampholder can be stored in a heat-resistant polymer lamp protector. Lampholders are supplied with wattage identification labels. 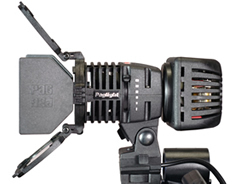 The PowerArc plug-in HMI unit makes the Paglight M the industry’s most powerful professional daylight balanced camera light for its size. The PowerArc utilises a 24W lamp which has an output equivalent to 100W of halogen light, but at daylight colour temperature. The quality and projection of the light output is far greater than anything that can be achieved using LED lights, and yet the power consumption is relatively low. The PowerArc Conversion Filter (9023), can be used to convert the PowerArc colour temperature to match that of tungsten light sources. Approximately 80W of tungsten light would be required to match this output - too much for normal Li-Ion batteries to be considered as a power source. However, the PowerArc lamp only consumes 24W and can therefore be powered from Li-Ion batteries.